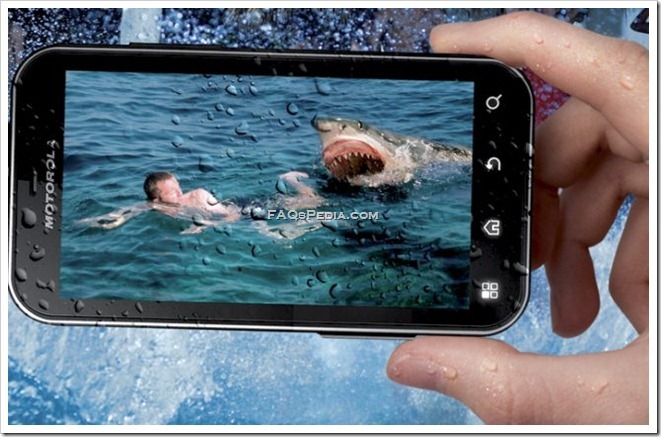 A sturdy product from the brand Motorola, Motorola Defy+ comes with a pocket full of surprises. The brawny smartphone is a descendant of the original Defy. The smart-looker that it is, it would compliment your personality as an outdoor adventurous besides being a great communication tool. If you love the sun and the surf and mountains and woods, you can take along this smartphone and stay connected and charged up. The makers define Motorola DEFY+ as an everyday tough companion with unbeatable endurance and matching style to put up with the most challenging situations. Besides offering the basic functionality of a cell phone, it would keep you charged up with all the entertainment and social media stuff that has become so crucial to our existence. 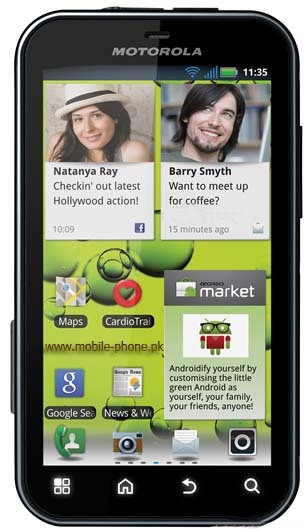 Motorola Defy+ comes with a 3.7 inch high resolution (864×480) FWVGA touchscreen display. Browsing web high speed and viewing videos without buffering is a dream come true experience with 1 GHz OMAP processor and Flash-enabled (Adobe Flash Player 10) handset. 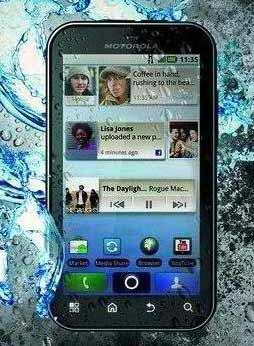 The IP67 certified Motorola Defy+ comes with enviable water and dirt resistance. Also it would withstand shocks and scratches to keep you relaxed while you go about carefree in a rough-tough daily schedule. If you like to keep memories alive, you can do so with 5 megapixel Auto focus camera. You can groove with the FM Radio with RDS or make good use of the 3.5mm audio jack. Those of you who can’t do without social media networking – the Facebook, Twitter and LinkedIn – would be mighty happy with the networking facilities that this macho smartphone offers. In Motorola Defy+, you can also create group emails to stay in touch with your family, work and friends separately. 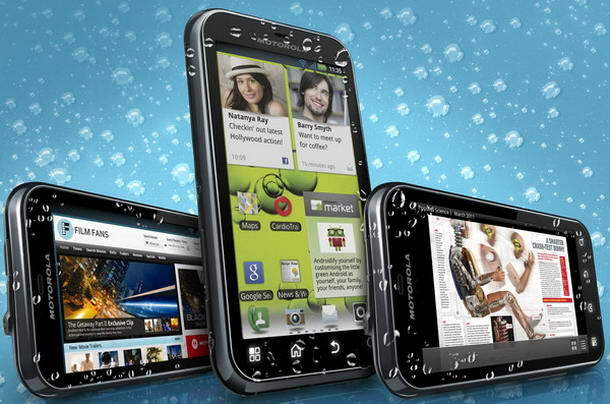 Motorola Defy+ is an Android 2.3 Gingerbread phone that lets you enjoy maximum number of apps from the Android Market. Motorola Defy+ has 2GB internal memory along with MicroSD card slot that capacitates saving all your data in 32GB card. Up to 7.1 hours of talk time along with 16 days of standby time is guaranteed by a 1700 mAh battery. Some of the other matchless features that makes it a must buy are MotoBLUR UI, Wi-Fi b/g/n, 3G Connectivity, LED flash, Bluetooth 2.1 and GPS with A-GPS. Motorola DEFY and Motorola DEFY+ are the two niche products of the brand Motorola. Motorola launched Defy in 2010, whereas it is supposed to launch Defy+ in September 2011. There are many similarities between the two phones which makes it easier for somebody who ha s been using Defy to switch over to Defy+. If we talk about extra and improved features, we need to mention that while DEFY has 800 MHZ processor, DEFY+ has a 1 GHZ processor. The other mention worthy feature is their operating systems – Motorola DEFY comes with Android 2.1 which can be upgraded to 2.2. Whereas Motorola DEFY+ comes with Android 2.3. Motorola Defy + would debut in the UK market in this September and would cost you £250. In India, it would cost around Rs. 20,000. It would be weighing around 118 grams and has two colors variants White and Black.